There is no instruction manual in life. Especially when you become an adult. Life is, at its very heart, a process of trial and error. Of taking educated risks. Of learning from your mistakes. Of doing the very best you could under the circumstances at hand. Life is a continuous journey towards something, but at times we're just not sure what that "something" actually is. And this is okay. There are lots of little stops and milestones along the way; enjoy them and learn from them, but they really aren't the "something". T.S. Eliot was right: It's about being on a journey where you end up arriving at the place you started and you know that place for the very first time. Life is ultimately even-handed. The most wealthy and famous among us sometimes suffer the most, and sometimes not-so-wealthy and unknown manage to live wonderful, fruitful lives. Why? Because the things in life that matter the very most can't be purchased and they have nothing to do with being well known or famous. Our wealth and our notoriety (or lack thereof) don't dictate what kind of life we live...our actions and our attitudes do that instead. Life is about kindness. That kindness has to include yourself for it to have any real meaning though. Life is about resisting advertising. 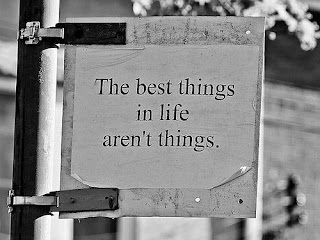 It's not the big, flashy things that matter the most or truly bring joy...rather, it's the simple things. No expensive perfume purchased at Saks Fifth Avenue ever smelled better than a lilac bush in early May. Life is about living within your means, but not because that's hard, prudent or what your parent's want you to do; no, it's about doing that because you deserve a life where you aren't held a slave to trinkets and things that are fleeting anyway.